“As a group, the flat fishes show a variety of feeding habits almost as great as that of all other species put together. They range from the burrowing bottom-grubbing soles to full-blown, fish-eating predators like the halibut and the turbot. They have in common a very compressed body and a coloured eyed-side that, together, provide them with a camouflage superior even to that of the renowned chameleon. From the angler’s point of view, the flat fishes alone could provide more than a lifetime of interest. Before giving any information on how to target flatfish it is probably worthwhile to provide a fairly detailed account of scientific studies on the how flatfish feed in the light of which some of our observations, and those of others, may be seen in perspective. The sea angler may find interesting some experiments carried out on the feeding behaviour of several common species. The idea of this work was to see which factors were responsible for stimulating feeding. In these experiments the `prey’ presented to the fish was in the form of models and scents and/or tastes (hereafter referred to as taste) . 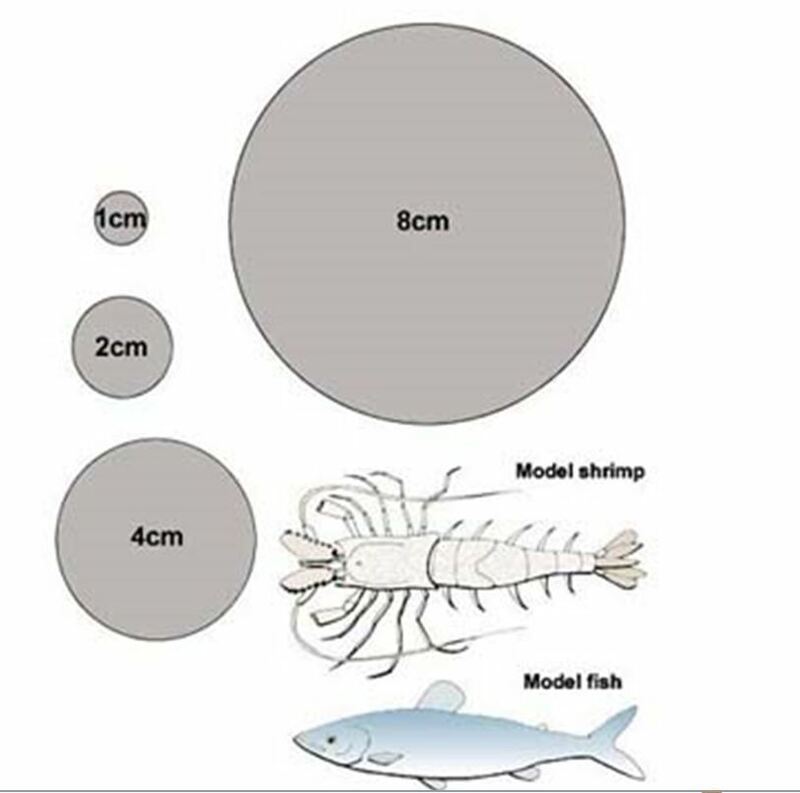 The models used were spheres of 1, 2, 4 and 8 centimetres diameter, a small model fish and a plastic shrimp. The spheres were simply meant to represent `food’ items of different sizes and from our point of view they could scarcely be better because lead weights of equivalent volume would weigh about .25 oz. 1.5 oz, 12oz and 6.5 lb. The largest would perhaps be a little on the large side even for a fast tide on the Skerries Banks, but even so the sizes are of the right order. The scents used were the juices of mussel or shrimp and (for experiments with turbot and brill} the juices of sole or cucumber smelt. The first tests were made with the sole – a highly specialised nocturnal-feeding, flat fish with a very well developed sense of touch on the underside of the head. The sole was attracted to the three smaller spheres and to the plastic shrimp but it panicked at the sight of the largest sphere. In all cases the attractiveness of the models was increased by the presence of mussel or shrimp juice in the water. Significantly the sole also showed a strong panic reaction to the presence of a small codling in its tank. The sole, although it is almost exclusively a night feeder, uses its powers of both vision and taste to locate its prey. As in the case of the fifteen-spined stickleback mentioned earlier, the effects of each stimulus were increased by the presence of another. It is perhaps surprising that the plaice, the flounder and the dab (unlike the sole) showed no interest in any of the spheres, expressing neither feeding nor flight reactions. Occasionally all three species would approach and snap at the plastic shrimp but only when it was moving. In fact, the dab even swallowed the shrimp in one instance. In contrast, when the juices of mussel or shrimp were in the water all three swam up to, and even bit at the spheres. A second set of tests also with plaice flounder and dab were designed to see how good these fish were at locating their food. To do this a fine jet of seawater was squirted from a tiny glass tube, the tip of which projected just above the surface of the sand on the bottom of the tank. The plaice was the only one of the three to react to a plain jet of water. Plaice, it should be noted, often feed on the siphon tubes of burrowing clams, tubes from which little jets of water are constantly being pumped by the molluscs. Where very dilute shrimp juice was added to the water jet, both the plaice and the flounder located and bit at the end of the glass tube. The dab was unable to locate the tube and just swam about aimlessly snapping its jaws. It clearly sensed the shrimp juice and when the 2-cm sphere was presented it promptly attacked it. The dab is by nature a more active hunter than either flounder or plaice, eating shrimps and similar fast-swimming creatures. All three fish are essentially daytime hunters in which both sight and taste are important. G.A. Steven, in his interesting account of the feeding of the `lemon sole’, which is scarcely an angler’s fish, describes how this fish is a specialist worm-feeder- and pounces from a ‘head in air’ position vertically down on the worms as they emerge cautiously from their sea-bed burrows. In this account he mentions that the plaice is not nearly so good at catching worms because it attacks by swimming with its body horizontal and its head close to the seabed. The dab, which is much more active than either, takes up an intermediate posture with its head slightly raised in an alert fashion. It feeds on a much wider range of food items. Returning to the feeding experiments, the turbot and the brill are closely related and very similar. They are active daytime feeders, mainly eating fish. Both species ignored the three smaller spheres even when mussel, shrimp or fish juice were in the water, nor did they show any reaction to the juices alone. As in the case of the sole, the largest sphere caused a very strong flight (panic) reaction. Fish that were previously buried in the sand came out and swam quickly away. The conclusion would seem to be: when fishing for turbot or brill, beware the use of short traces, which place the bait too close to large leads. If they were moving, models of fish were approached and snapped at by turbot and brill. Moving plastic shrimps were also attacked, but neither mussel, shrimp or fish juice enhanced the feeding behaviour. Generally, sight feeders such as turbot, bass, pollack or mackerel, react only to something that looks and moves right (i.e. like the normal prey) and not to mere lumps of material such as rough old chunks of bait. They may even be terrified of large non-food objects such as lead weights. The structures of the brains and in particular of the guts of the flat fishes considered above bear out the observations described. The fish feeders have larger mouths and stomachs and shorter intestines than the other species. The gill rakers (comb-like teeth on the inner edges of the gills) of the turbot and the brill are few and large and serve to prevent the escape of large prey through the gill openings. In contrast, fish such as the sole, which feed on bottom-living animals containing a large proportion of indigestible material, have small mouths and stomachs, very long intestines and small fine gill rakers. Dab, plaice and flounder fall into an intermediate group. Now we can take a look at the flounder, which can be found in fresh and salt water and feeds actively in both. Although the amount of time which we have spent fishing for flounder is small we have caught comparatively large numbers of these fish. Locations vary from the waters of a large chalk stream-the River Frome (five miles upstream of the tidal limits) to the estuary downstream of Wareham and out over the broad grey mudflats of Poole Harbour. (In NZ the black flounder has been found up to 250 kilometres upstream sometimes navigating swift, gravelly rapids and I personally have seen them in the Manawatu River near Palmerston North in the 1970’s). Generally the flounder is a very obliging fish and during the spawning migration of the adults from rivers to the sea, which takes place in autumn and early winter, large numbers are caught in estuaries. Legered earthworm or, even better, ragworm are successful baits in this situation and the former is effective well up into fresh water, with fish of up to 1.5-pounds in weight being taken at times. Legered or paternostered ragworm is also effective in the sea and harbour and anglers casting from the muddy and sandy shores make large bags of good fish, particularly in winter. (In NZ, the Yellowbelly flounder moves offshore to spawn between winter and spring. In the Hauraki Gulf, spawning occurs during September-October in a belt extending from Tapu on the eastern side of the Firth of Thames, north-west towards Ponui Island. Spawning takes place in water depths of 18-27 metres). 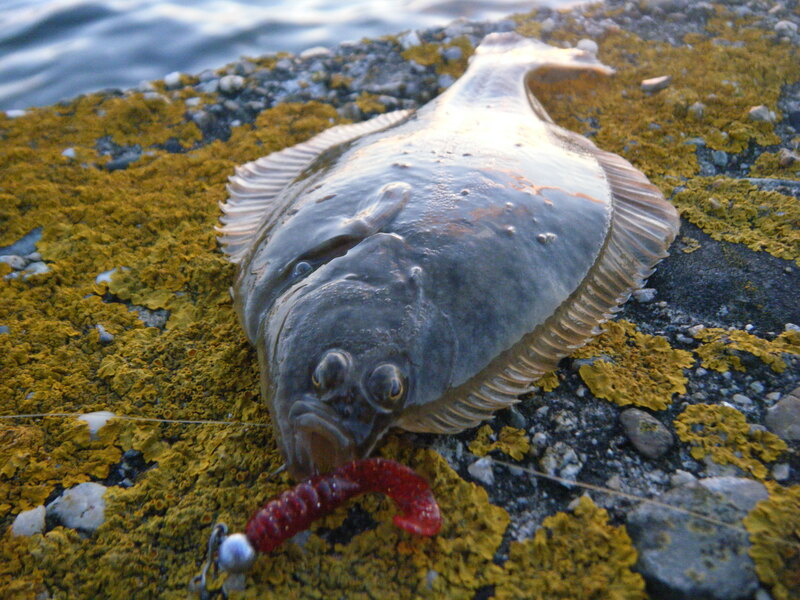 Flounders will feed in almost unbelievably shallow water (as little as 2-3 inches deep) and even large fish can be caught when the tide begins to flood over sandy beaches and mud banks. The angler must be prepared to put up with a certain amount of scorn and derision from bystanders if he is to make the best of the tide. He must cast only a few yards out, into shallow drainage gulleys, as the water begins to creep from the deep channels into which the fish retreat at low water. In the early 1960s I spent three years studying the animals of the sand and mudflats on the coast of Northumberland. During that time I caught numerous flounders using a 7-foot spinning rod and 6-pound line. Retreating before the rapidly advancing tide and casting into the water at my feet I took fish of all sizes on worm, cockle mussel and crab, but the largest fish, a 3.5-pounder, was landed on a freelined live sand eel. 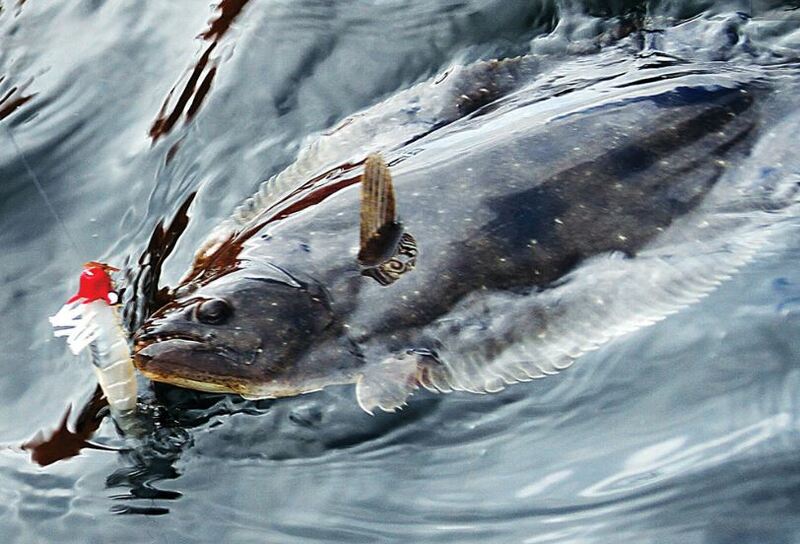 A species that seems to have a similar behaviour pattern to our flounder is the American `winter flounder’. Observations made on this fish by using underwater television showed that the winter flounder ‘surges’ into the intertidal zone in a short period two to two-and-a-half hours after low tide. Later, on the tide, the fish spread out and are presumably less easy to find and catch. Between the tide marks is the major feeding area of the winter flounder. Flounders spawn in the sea in early spring and peak numbers of flounder larvae appear at this time. In summer large numbers of tiny `postage stamps’ can be seen swimming over the stony bed of the River Frome estuary or inching their way along the vertical walls of quaysides and bridges as though they had been licked and stuck down. (In NZ juveniles also are most prevalent in estuaries over the summer months). 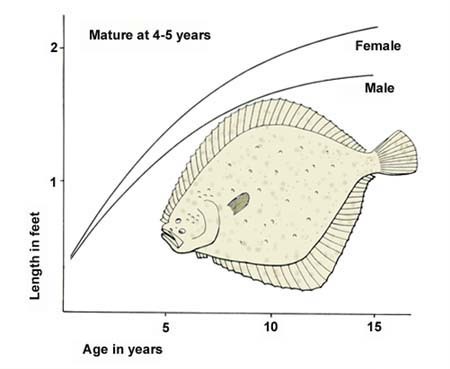 The flounder is in peak condition (fattest) over the summer period; conversely, they are thin and in poor condition from the end of winter to early spring, after spawning. In relation to this the fish feed more actively in summer than in winter and almost twice as many of the fish netted from the Tamar estuary in the summer months had full stomachs compared to those taken in winter. The main foods of the flounder are shore crabs, worms and small fish”. Hopefully this summary of the feeding behaviour of the most common flat fish will give you some clues as to when and how to target them with a rod and line. As you can see from the images in this article flounder readily take soft plastics and they are also suckers for a well presented fly. The key to success is learning where the fish are likely to be, stalking the area carefully and retrieving the lure slowly enough and close enough to entice a strike. Great article. I’m looking to target flounder with lures as my next little fishing challenge. It’s pretty difficult to find good info on targeting them this way. I found an interesting tip from someone in the USA who uses soft baits, but twists the hook in the jig head sideways to line up better with their mouths. He apparently has a better hook up rate this way. Back when I was younger I caught some on Waikanae Beach using a tiny hex wobbler, but I haven’t tried since. Thanks for the kind words and jig head tip. Great idea. Hi, is it safe to feed anchovy to farmed flatfish ? Sorry I am unable to answer this question definitively. Probably OK but are there local regulations covering this? Nice article ! I was wondering if Flounders would take softbaits as I regurlarly sight them on the edges of a sandy harbour I like to go to for a sunday fish in search of the odd Trevally or Kahawaï. When sighting them I had actually tried casting small 3″ baitfish imitations to them but without success – this artical made me want to insist 😉 ! If you can see flounder then you should be able to catch them using a small whirl tail soft plastic or fly. I’d drop down 2”, reduce size of jig head and slow down your retrieve. 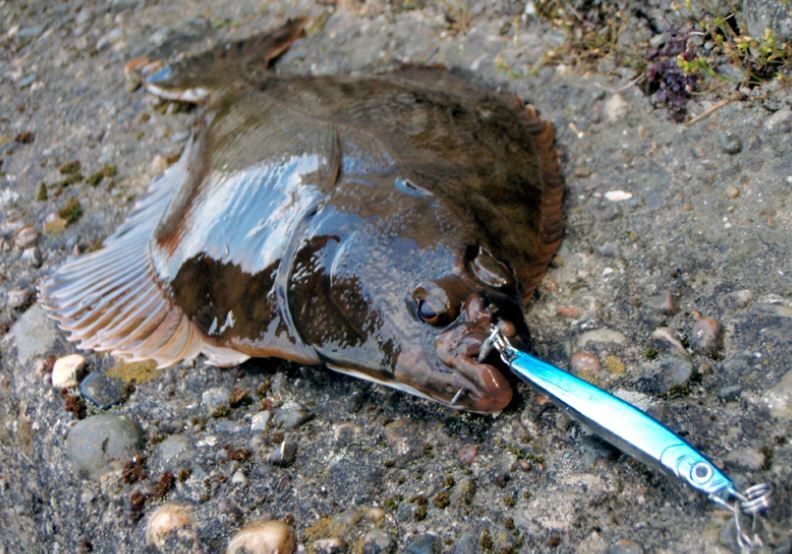 Flounder are aggressive predators but it can take a few sessions to learn how to hook them. Tiny crab patterns twitch along the bottom should also work.